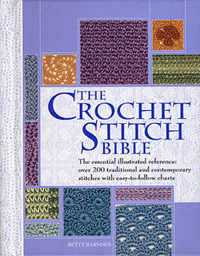 The Crochet Stitch Bible is one of my favorite and most used crochet book in my collection. Yes, there’s lots to rave about in this book, which I’ll be sure to tell you about. But there is always small flaws, which I’ll share with you as well. As the title implies, The Crochet Stitch Bible is a book containing lots of stitch patterns, over 200 to be more precise. The stitches are organized into 14 different categories from basic stitches to special techniques such as texture, shells, lace, and Tunisian, just to name a few. Having so many stitches to choose from can be overwhelming, but the most convenient part of the book is that there is an eight page “Stitch Selector” where you can preview a small picture of each stitch without having to thumb through the entire book. If you have trouble reading crochet patterns, then you’ll probably have trouble reading these too. But good thing each stitch pattern comes with a picture of a completed swatch and a stitch diagram. If you need more experience working with stitch diagrams or with reading patterns, this book also provides you with a great abbreviation list and symbol chart. Just be patient with learning. In addition to the great stitch patterns, this book also serves as a great reference book. It’s hard to remember all the stitches and crochet techniques you learn, so having this book comes in handy. The beginning of the book covers a lot of the basics of crocheting, such as how to get started holding your hook and yarn, basic stitches from single crochet to Solomon’s Knot, changing colors, measuring your gauge, and blocking. The only downfall is that the pictures aren’t too detailed. For those that require lots of step-by-step photos for basic stitches, you’ll be better off using the How to Crochet tutorials here on Crochet Spot. Overall, I’d say The Crochet Stitch Bible is a great book to keep as a reference. If you’re a designer the stitch patterns are a great way to get inspiration. But remember, these aren’t patterns for a particular object like clothing, blankets or toys. These are patterns to show you how to crochet certain stitches so that you can create whatever you would like with it. I would recommend this book for someone who already knows the basics and desires to explore even more crochet stitches and techniques. If you decide that this book is right for you, please use the link above when purchasing with Amazon, as a small portion of your purchase will go towards supporting Crochet Spot! This entry was posted on Wednesday, June 16th, 2010 at 1:11 PM by Rachel Choi	and is filed under News. You can follow any responses to this entry through the RSS 2.0 feed. You can leave a response, or trackback from your own site. Amazon Shoppers Can Support Crochet Spot! I will check the Bible next time I see but in the mean time this is the one that I use. I’m not so good at reading patterns but this is pretty easy to follow. Between this book and Donna Kooler’s Encyclopedia, I’m all set! Thanks for the review. I would also suggest: Beyond the square Crochet Motifs by Edie Eckman. It’s AWESOME! I might have to check out the Bible and 365 Crochet Stitches as well. Thanks! I just bought this book not too long ago. It comes in handy at times, and I like to add new stitches in that I’ve found elsewhere (only without the chart), that way they are all in the same place. I have this book and I agree, it is an invaluable reference that anyone who crochets should have on hand whether you are a designer or just crochet for fun and relaxation. You have to add this book to your must have list! I use that along with several other books including antique books I have aquired over the years, I usually modify the stitches in this book as they use a lot of convoluted instructons and make it harder than it is. does this book show actual pictures or diagrams? Bananas, the book has stitch diagrams and an actual picture of the finished swatch for each pattern. When I first started crocheting a few years ago my daughter gave me this book as a gift. I LOVE it. When I get confused on a pattern or stitch it is a great book to have. I like the loose leaf binding as the book will lay flat. The “Stitch Selector” pages sounds like a good idea. Generally speaking, I don’t have a lot of troubIe reading patterns but I rarely even try symbol crochet — it intimidates me! (My husband says I’m “spatially” challenged!) Having the pattern swatch, pattern words, AND the symbols might help me overcome my fear of symbol crochet. I know that this book would help me out a lot. I know that it would help me teach my disabled daughter who is wanting to see how to do the stitches but she needs the pictures in front of her and not on a screen. Plus it will help me with my seashell stitch and so I can also learn new stitches to make blakents for the nursery at the local hospital. I am trying to learn tunsian crochet. I think I am having a problem because I learned to knit before I learned to crochet. I also crochet left handed. I hope that this book would have an explaination on how to do the stitch, not just pictures because sometimes I have problems figuring out how to do a stitch just from pictures. bead work including bead stitch and single crochet with beads. I would like to learn the waffle stitch. I like that the book also shows the meaning of symbols.